This type of lions are popularly found in Fujian Province. Usually comes in a pair, one will have its mouth opened while the other has its mouth closed. The lion is known as the king of jungle, and it plays a significant role in feng shui as the ultimate guardian of wealth. As a good modern time example, the symbol of lion had been cleverly tapped to bring much success in the management of Singapore. It was not a coincidence, but the symbol had been deliberately designed to represent Singapore after seeking high ranking feng shui masters' advice whom the previous leaders of Singapore had consulted. 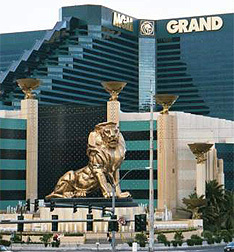 The other well to do living example is located in Las Vegas city, the MGM Grand. This hotel casino entertainment center has a golden big lion statue righ in front of its premises along the famous LV strip. Next, the only bank that stood with the smallest burst in its bubble during the black october was HSBC; which had always used the lion to guard its entrances in Hong Kong. The lion is the ultimate protector against unexpected financial losses, prevents outflow of wealth, avoid difficulties and improve your fortune. It also greatly brings out the glory for the breadwinner, CEO of a company or the patriarch of the family. The lion is a powerful symbol that can provide potent protection for palaces, banks, mansions, shops, malls, businesses, hotels and jewellery shops. This lion is practically seen almost everywhere in Hong Kong, China and Singapore, the fastest growing economies in Asia. The lion when used as company logos had also proven to provide quick growth and prosperity. In short, wherever this grand symbol is used, it benefits so many countries, companies and individuals. The lion is excellent to provide ultimate protection, wards of evil spirits and harmful people, nourishes chi that enters homes, bring in happy blessings and dissolves bad chi from our indoor's sharp edges. When placed facing the maindoor, they prevent robbery/theft, ward off harmful people, bring in more good fortune/ better sales and improve feng shui of entrances. The lion can also be placed in offices to scare away office thiefs and ward of people of bad intention from harming you. Besides being an important protector, the lion is also a generator of good fortune because it has be characteristics of being able to swallow any tough animal in the rough jungle. Its mouth which can go widely opened with sharp teeth is best regarded as "ability to eat whatever that comes your way". Which means, this will benefit those who are in sales and doing business. To activate this, one must place them in their personal sheng chi direction, on their workdesk or at their cashier. The lion also signifies the glory and grandeur of the breadwinner or patriarch of the family. They are best used to boost up the fortune of the patriarch of the family so that he is tough, resistant, alert, able to counter any obstructions and brings success to carve out a dynastic family. To activate this, one must place them in the NW corner of the house or living room. These lions also make powerful door protectors at your doors or entrances. They can also be displayed in your beautiful gardens, on the ground or high up to ward off harmful characters and protect against burglary. They can be displayed both in the interior and the exterior.